When Leo was a tiny little man, who was most contented in his Mummy's arms (this feels like such a long time ago now...) he suffered temporarily from bout's of Colic. Colic is a common condition in young infants and can leave babies crying for no obvious reason. Colic is a abdominal pain that is said to be brought on by wind or indigestion, and can leave our little ones feeling very un-comfortable. Leo has been sent a 5oz MAM Anti-Colic, Self Sterilising Bottle to put through it's paces. I was apprehensive as Leo obviously does not suffer from colic now and has no problem bringing up his mighty wind all on his own. He has also been very picky over what bottles he will actually drink out of due becoming very familiar with our usual brand that he has known and loved over the last 12 months. - Silk Teat: MAM’s patented Silk Teat® is silicone with a difference: it’s silky soft. No other silicone feels softer. - Scientifically Proven: MAM products have been developed with health care professionals. - Functional Design: Wide openings for easy filling and cleaning; stands up securely. - Easy to use: The leak-proof cap is ideal for the dynamics of everyday baby life. - Self Sterilising - The bottle can be sterlised within it's self taking away the need for a separate device. The package was received very quickly and upon opening we were presented with a lovely Green bottle with Four Leaf Clover images dotted around the measuring line. It is a nice looking bottle as far as bottles go. I chose to try Leo with the new bottle for a day feed, as he only has around 5-6oz during the day now, but for his night time bottle he still has a 8oz bottle of milk, so this new bottle would not accommodate our last bottle before bed. You can however purchase this bottle in the 9oz size for those hungrier babies, this 5oz size is perfect for babies who are being weaned and no longer require such a large bottle of milk, or newborns who are not drinking as much just yet. I took the bottle apart and gave it a thorough look over and then began washing it up. I was very impressed that you could take everything apart and clean all the nooks and cranny's. 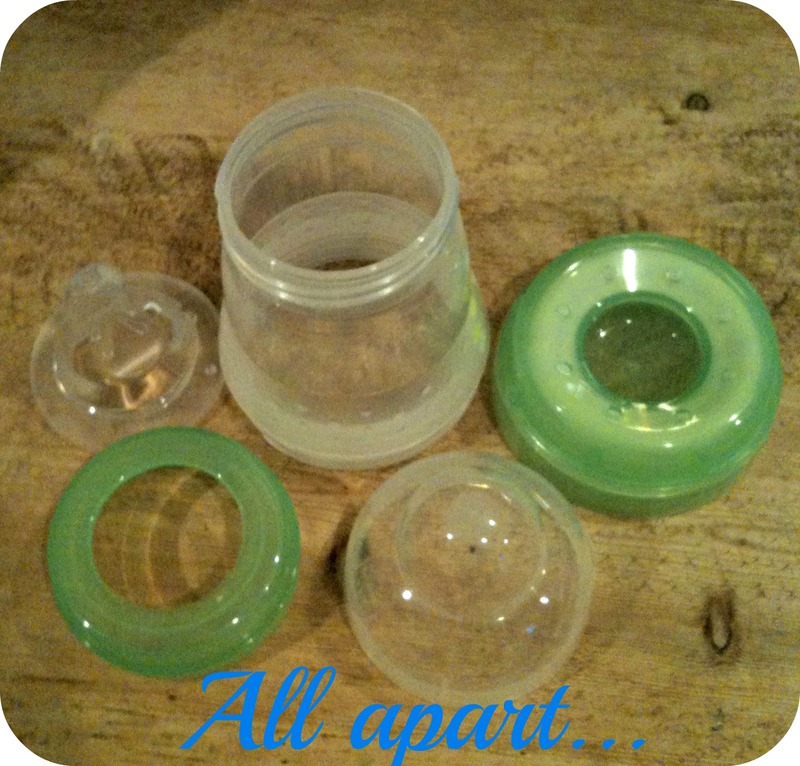 The base comes off the bottom giving you clear access to the bottle it's self, and the teat and lid are all equally accessible to clean. This clever little bottle has a self sterilising function. You simply fill the base with 20ml of water and place the contents of the bottle on top of the base, before finally putting the lid on top and zapping it in the microwave for 3 minutes. This makes this bottle a great choice for those of us who are brave enough to go abroad with our little people. 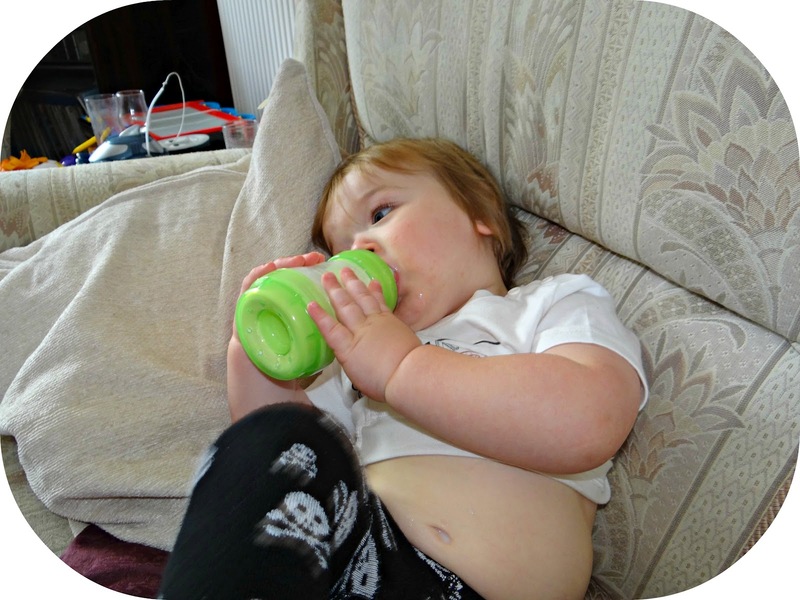 Leo latched on beautifully with the MAM bottle and even took it off me so he could hold it himself. We experienced no leaks, which I admit I did worry about when I realised that the bottom of the bottle also un-screwed. In fact we have found it great and the fact Leo took to it is also a big bonus. 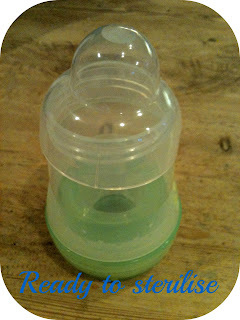 So how does this clever bottle help with Colic? On the base of the bottle their are ventilation holes, it is these clever little beauties that ensure a smooth flow of milk, making sure that babies do not swallow any air. In research carried out by MAM it has been confirmed by us: the parents that 80% fewer babies using these bottles suffer from colic. (Research carried out in the USA in November 2009). 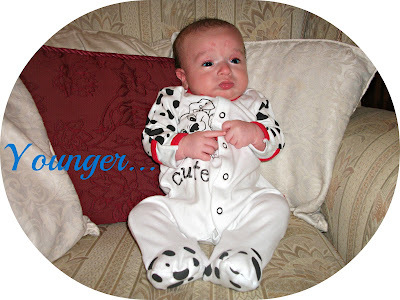 Now I cannot confirm nor deny this research as Leo is past that stage, but it is food for thought for any parent's who may be dealing with Colic. 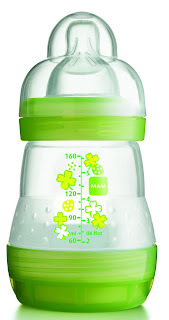 All of the MAM bottles are BPA free (free from Bisphenol A - which is a industrial chemical that has been used to make plastic and resins since the 1960's.) making them completely safe for babies and giving Mummy piece of mind. These bottles come in three sizes (130ml, 160ml and 260ml) all in various colours and designs. They are available to buy from Boots, Mothercare, Toys R Us, Independent Nursery & Pharmacy Outlets as well as MAM UK shop. Prices start at £4.29. I highly recommend these bottles to anyone who is looking for a possible solution to Colic and of course if you are travelling abroad with an infant. This is a sponsored post but all views and opinions are my own.